This neighbourhood spans from Yahk to Riondel. ﻿The history of an area greatly influences the present day character and quality of it's community. This area is where the land and water people unite. The cluster of communities were primarily settled in the early 1900s. Creston was first settled in 1883 by European settlers as a regional mining and exploration post and later to develop a forestry and agriculture economy. Riondel community, at northwest section of the valley, is located on the Kootenay Lake or otherwise known as the East Shore. It was renamed from Hendrex to Riondel in 1907. The community of Yahk is at the other end of the larger community beyond the valley but it is on the Moyie River which is a tributary of the Kootenay River and Lake. Yahk was first settled when the Canadian Pacific Railway laid a siding in 1899. Most recently, the area's lifestyle attracts a growing number of retirees and young families. But it was the Yaqan Nuki people (with regards to current administration, they're known as the Lower Kootenay Band) who were the first inhabitants of this region. For more history visit the local museum. This is the sweet spot of the Kootenays! Located half way between East Kootenays and West Kootenays. The convenient location is perfect for enjoying all that the Kootenays has to offer, while living in the sweetest place. The combined population is 13,172. The locals refer to the communities on the east shore of the Kootenay Lake, from Kuskanook to Riondel, as one large community called East Shore. The other communities in this area are referred to as Creston Valley, except for Kitchener and Yahk. It is worthwhile noting that the Creston Valley and East Shore do not switch over to "Daylight Savings Time". It always stays on the same time year round. The average drive time to these neighbourhoods from Creston is about 10 minutes, except Kitchener is is approx. 15 minutes east on Highway 3, and Yahk is about 30 minutes east. Heading north on Highway 3A takes you to Boswell in approx. 30 minutes, Crawford Bay in 45 minutes, and Kootenay Bay/Riondel about 60+ minutes depending on seasonal traffic. Each one of these neighbourhoods have their own unique character and qualities that are influenced by their history, geography and rural living. Our people naturally learn to be resourceful and collaborative. The following is my impression of each neighbourhood but I highly suggest you talk to the people that live there to find out what makes it special to them. This is a place where you can be your genuine self. The following communities are not presented in any particular order. 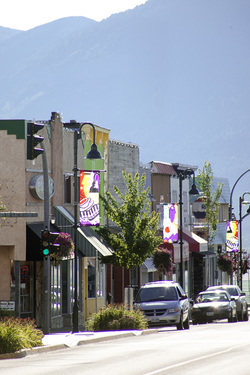 Creston is a service hub for the neighbourhoods within the Creston Valley and the East Shore of Kootenay Lake. Creston is a cozy town with, in my opinion, pretty much every primary service I can imagine wanting and needing. It is interesting that when most people feel cozy and comfortable they don't have a strong urge to create change. It is said that "change takes time in Creston" or another way to put it is "Creston is the place where time never changes and change takes time". It certainly feels that way for "Type A" personalities (perhaps by the town not jumping into things they avoid problems). However, change does eventually occur and when it does it is splendid. I have lived in Wynndel for over 20 years having come from Creston before that (but I was raised in Alberta). Wynndelites like to think of their hamlet as a village. After all it has available municipal water, natural gas, fire protection, Wynnwood Lumber - Canfore, also Wynndel Foods and Gas and our Wynndel Community Hall and Arts Studio (with many of its social functions). What more do you need? Well for most the close proximity to the Kootenay Lake. Kuskanook Harbour is a 10 to 15 minute drive from Wynndel. This is a good place to keep your boat. Kuskanook has several lucky full time residents who make this destination their home. Crawford Bay is located on the Kootenay Lake. As I see it, this is a place for a meeting of the minds, at the heart of what really matters in life. As a result the community has a very eclectic style that ranges from Bohemian to executive. From my observations this area attracts self reliant collaborative souls, who are likely artiststs. Crawford Bay has one of BC's most scenic golf courses, Kokanee Springs. This area is becoming known for mountain biking. A local trail map makes it easy for newcomers to get out on the trails, on foot and on a bike. My family roots are in Erickson. This community (with most municipal services available) I feel is understated for being hardworking. Perhaps because those who live here are primarily productive orchardists who are doing what is natural for them. Also I have noticed that the retirees who reside here love the feel of an honest day's work, even if it is for themselves in their large landscaped yards and gardens. I particularly love being in Erickson during blossom season and late summer when the fruitstands are overflowing with produce. And now we are fortunate to have vineyards with wineries: Skimmerhorn Winery and Bistro and Baillie-Grohman Winery, and Wynnwood Winery. When the people of this valley think of Canyon, its likely they think of fly fishing, orchards or horses. Historically Canyon Park hosted Chuckwagon and Chariot Race competitions during the Blossom Festival. Now the facility mainly used by the CV Horse Association and 4H Club. Canyon Park with its ball parks and camp ground, is still very important to the community. As well their hall, Canyon School and their community store. The wide open spaces in Lister provide for some amazing views of the Skimmerhorn mountains and vistas of rolling farm lands. I particularly love riding my bike in Lister. Most people who move to this area now do so for its pastoral setting. There are founding families in this area whose forefathers settled in this area to farm. You will notice many working farms here. However quiet a few are now what some call "gentlemen farms" with the addition of their large bay garages that house collector cars. The airport is located here and it is important to the valley as a whole. The airport not only serves local pilots, it also provides for emergency air ambulance and forestry firefighting. The Creston Valley Golf Course is also a gem for this area with its championship 18 scenic holes scenic course design and with its busy club house restaurant. The Lower Kootenay Band with its Yaqan Nuki people have a village in Lister but they also have lands throughout the Creston Valley and Kootenay Lake. The Band hosts an annual traditional Pow Wow during the Blossom Festival weekend where the public are invited to attend. Their office is located just off Highway 21 southwest of Creston and there is also an interpretation centre located within the Legend Logo store and you can learn more by going to Ktunaxa Nation website. On first impression you might think that the people of West Creston like to be left alone to enjoy their own piece of paradise in solitude but then attend one of their community functions and you will discover that they are not reclusive, they just retreat to their sanctuary to be refreshed for receiving company and for their social events . I particularly have enjoyed their down home fun events, including "Corn Krickers Picnic" where you can join in on a 3 Legged Race, partake in Roller Pin throwing contest and even Chicken Shitting Bingo. The Creston Valley Wildlife Discovery Center is located in West Creston with wonderful opportunities to spot wildlife and to bird watch. This area also includes some amazing walks through the wetlands and channels for flat water canoeing or kayaking. Kitchener is enjoyed by many valley outdoor recreationalists because it provides access to ATV trails, fishing holes and hunting grounds. The weather here dips down in the winter from the rest of the valley but those who live here don't care because they play in the snow, there taxes are cheap, fuel for wood stoves is plentiful and they live on route to Cranbrook for its additional services. The community of Yahk was developed when the CPR laid its first track back in 1899. The trains still run through this area. It is situated on along the Moyie River. I find the people here are mostly outdoors enthusiasts and independent thinkers, who are also community oriented. I have to smile when I think of the community of Yahk Kingsgate because of their hospitality and eclectic expressions. Just attend one of their community functions, perhaps a fair or their Summer Fest with rafting, to see what I mean. Nestled in the pines is a beautiful Hall and amphitheater with outdoor kitchen and outdoor heated bathrooms. It is available to rent for private events such as a family reunion, wedding, birthday party or workshop. The community has broadband internet service, a convenience store and gas station, 3 RV parks, a reading room with book and video rentals and a historical room. It is the little things that matter here, like the starry night sky and having wildlife at the backdoor. Many visitors are attracted to this area for its camping, ATVing and snowmobiling. The Yahk Provincial Camp Ground is conveniently located just off the highway and along the Moyie River. When visiting please remember to help keep Yahk area pristine by packing out your garbage. Lakeview is considered part of Wynndel but they do have their own character. They are nestled behind Goat Mountain or Arrow Mountain and can be accessed off Hwy 3 at Arrow Creek Rd (leaving the east end of the valley after Erickson) or off of Hwy 3A at Lakeview Rd. (between Wynndel and Creston). The people who live here are private and independent and they still like to plug into town activities when they want. These residents appreciate nature in its raw form. Perhaps that is why some are artists and others are hikers. They are neighbourly even though there homes are spaced out and hidden amongst the trees. This historical 1900 site once had lake boats and trains pulling up to the buildings that are now gone, mostly due to fires. Apparently it is said that Kuskanook once had 17 saloons. Now this site comes back to life in a different way, on warm summer days boaters arrive with picnic baskets and water toys. The people who live along this section of Hwy 3A section are mostly seasonal residents. The Kuskanook Harbour Society is responsible for maintaining the harbour. Contact the society if you are interested in docking a boat here. The Twin Bays community is a short drive off the Highway 3A and resides within two bays. One bay has a beautiful public beach and the other holds a marina. There is a public parking lot within walking distance of the beach access and an outhouse. There are several luxurious homes amidst the average priced lake homes. Sanca Creek also has public beach access but it doesn't have the same beach setting, nor the outhouse availability. The community has a few full-time residents who enjoy the serenity in the winter months. Sanca Creek also has access to back-country roads where you can access mountain lakes. One local favorite is Wooden Shoe Lake. Twin Bays is about 20 to 30 minutes from town and Sanca is a little further north. This community is very active. From what I have noticed they are also a tight knit group who are very inclusive. They seem to know how to make their own fun and take care of their community's needs. Most of their activities show up through their busy Hall schedule of events. There are many seasonal residents along this section of the east shore of Kootenay Lake but there are many more who are full time residents that with their enthusiasm make up for those who are absent. These people love the lake and the outdoors and they attest to the lake being responsible for the apparent longevity of it's people. Mountain Shores Resort is a community within Boswell. This gated community makes rural living look easy (they even have their own marina with fuel). Most of the other residents appreciate the independence that comes with rural life but that doesn't mean they are reclusive, far from it. For instance, Boswell has a hiking group with well over 100 members. They meet every Wednesday during the hiking season to venture out and explore the back country together. Any inconvenience of commuting for additional services in Creston or Nelson is viewed as a cost of having this ideal life. However, there is a concern for those creeping up in age that one day they may have to leave the lake if they were to lose their drivers licence but then there is always someone going into town that can give them a lift. Strung along this section of the lake road you will also find tourism related businesses to visit and explore. Public lake access sites are not easy to find unless a local points them out to you or you go to the RDCK maps or Creston Valley Trails website. These maps can help you to find those access points. Today there are many seasonal residents in Gray Creek who make this beautiful location along Hwy 3A their "home away from home". A visit to the historical Gray Creek Store tells tales of life here from 1913 on, beside supplying today goods for all the residents' essential needs . Gray Creek Hall is a 100 year old log building. It provides a cozy space, with lake view, for residents to congregate in and workshops to be hosted. For a family adventure visit the ﻿Tipi Camp﻿ on Pilot Point, just a short boat ride from Gray Creek. This area is around the corner from Crawford Bay. The world's longest free ferry ride (30 minutes) takes you over to the other side of the lake to the community of Balfour. There is a public boat launch near the ferry landing. A short drive along Pilot Point will take you to Pilot Point trail head. This trail follows along the lake and gives you access by foot to a provincial marine park and other beaches. A little further down the road is a trail head to a historical lighthouse where you can enjoy an amazing view of the lake. ﻿Riondel is at the end of the road for this side of the lake which gives it a peaceful quality. Riondel sits right at the edge of the lake and this gives it a vacation feel. Within its town limits is a beautiful park along the lake with camping facilities. This park attracts visitors during the summer. Residents say this is a nice change of pace from the quiet winter months. Many residents enjoy the lake for its scenic beauty and for all the water sports activities it provides. This location is also known for its hiking trails and having its own special golf course. The Riondel Golf course is enjoyed by those who don't take the game too seriously and enjoy life as it comes. The more serious golfer can drive down the road to Kokanee Springs Golf Course. Riondel's history goes back to 1882 when it became a booming mining town with the Bluebell Mine until the mine closed in 1972. Now it is a haven for retirees to spend their leisurely summer days before heading south for the winter. This little town has its own fire department, grocery store, restaurant pub, a good internet service and community center. It has an active community that includes the performing arts. The lake has a spiritual quality that many people connect with. The Yasodhara Ashram, a yoga retreat and study centre is a special place to visit whether it be to partake in one of their programs or to drop by for a short visit.